San Diego Mountain Biking Association is excited to announce new trail coming to Mt. Laguna! The below map is a draft as of May 5th, 2018 of a proposal we have been working with the Descanso Ranger District since 2016. Please note this is a proposal and has not undergone a NEPA review. Further, we do guarantee this is the final version of the proposal due to changes that may need to be made during the NEPA process. 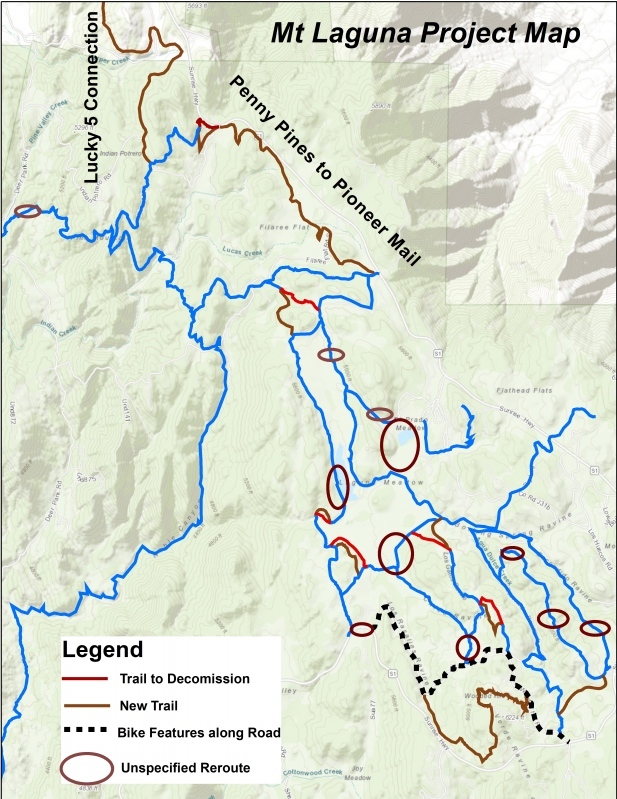 This map is a compilation of many asks from SDMBA, but also several trails have been identified for reroutes from the Descanso Ranger District. This proposal's main goals are to improve connectivity, reroute unsustainable section of trails, bring non-system/social trails into the system and improve mountain biking opportunities within the area to offset user conflict/trail congestion. We have identified nearly 15 miles of trail that will need to be examined under the NEPA review, but we are confident this plan will improve recreation while also further protecting sensitive resources in Mt. Laguna. July 2016: Descanso Ranger District Recreation Officer invited to SDMBA Advocacy meeting. February 2017: SDMBA approached Descanso Ranger District with an interest in working on improving our beloved Mt. Laguna trail system. March 2017-March 2018: several proposal were created, ground-truthed, presented, modified, enhanced, removed and rendered. April 2018: $15,000 REI Grant awarded to SDMBA to support this project and help fund planning and necessary studies. May 2018: agreement reached on scope and scale of proposed project for Mt. Laguna enhancements between Descanso Ranger District and SDMBA. October 2018: Forest Service will start the NEPA review process as we enter the Forest Service's 2019 fiscal year. SDMBA will most likely enter into a formal collection agreement with the Forest Service. This agreement will allow SDMBA to provide the funds to pay for all the USFS staff time relating to this proposal in addition to our existing volunteer agreement and commitment to assist the Forest Service in building these trails once approved. Sometime 2019: projected completion of NEPA review, project proposal approval and we start the real work!